Zeus is the biggest male we've ever seen, and his splendid physical presence is more than matched by a gentle and placid disposition. Readers following our summer summaries will know that we have't seen Zeus since end of August 2002. 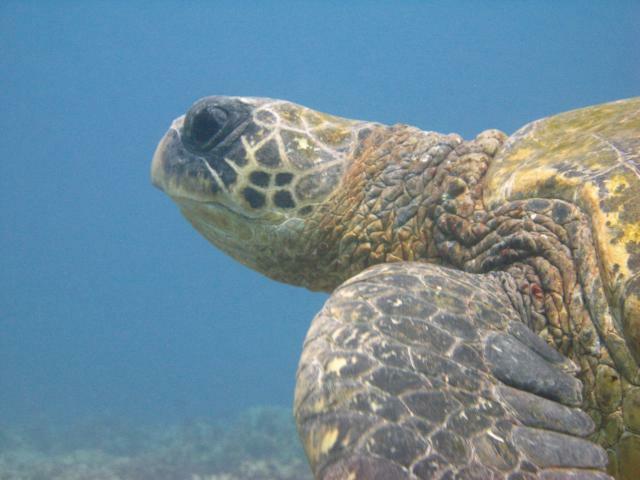 A photograph shared by tourist-diver Rob Hawes established Zeus was resident to Honokowai as far back as March 1992. We, however, first met Zeus in 1994 and had seen him every summer afterwards--until 2003. We love Zeus, and when Summer 2003 passed without seeing him we worried. Summer 2004 saw us actively searching for the Big Guy. This summer, we entered the water many times with the hopes that this would be the dive when we'd see Zeus. At one point Ursula said she thought she saw Zeus, but the honu was just too far away to make out the facial markings to confirm. Then August 28th rolled around: Peter's birthday. What does Peter want to do on his birthday? Dive, of course. 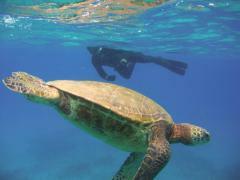 Be with the honu, of course. As we got set to head in the water, Ursula said, "Wouldn't it be nice to see Zeus for your birthday." "Ursula had settled down to take picture of Ho'oulu and I was hanging back so as not to disturb. I looked up and saw a large male honu swimming directly towards us. As he got closer, I started to get goosebumps. It was too good to be true, but I thought it was Zeus! "I fumbled with my camera, afraid I might miss getting a photo. He was closing quickly and I was sure now I recognized Zeus. He has a distinctive profile, but what I recognized immediately was his eye. It's unique. "He swam so close to me that I could have touched him. I wanted to. I wanted to grab him and hug him and thank him for the birthday gift. Of course, I didn't. I snapped his profile instead. "I was hoping he'd stop, settle down, and let Ursula see him too, but he must have had other business. He just kept swimming. Ursula had never looked up. "I spent the rest of the dive in daze. I kept looking at the image trapped on my camera's viewscreen, trying to convince myself that I hadn't dreamed it. It was incredible. I'd seen Zeus--on my birthday! "Later, when I showed Ursula the photo, we wondered where Zeus has been, and where he was going. We sure wish he'd stick around, but as I said to Ursula, I don't care if he's moved just as long as he's okay. Thanks, Big Guy, for setting our minds at ease." Seeing Zeus again was the Highlight of the summer. If Honokowai has a King then Zeus is it. Kings are Highlights. There is another male we were keeping our eyes open for, however. Nui, a mere youngster with a short stubby tail back in 1990 when we first met, is now an adult male honu who's taken regular trips to the honu breeding grounds of East Island, French Frigate Shoals. We hadn't seen Nui show up even once at his favourite foraging site, so we figured he was away making more honu. All we hoped for was that we'd still be here by the time he returned. Well, this week, he did just that. Resting in the sand, looking pooped-to-da-max was a male with a ultra-clean shell--our #1 clue that the turtle was an Outta-Towner. As we approached we recognized the familiar " acorn" facial pattern as that of Nui. He didn't respond at all at the sight of us--so oblivious dead-dog-drug-out he was from his long journey. 1990. We now have known Nui for 16 summers. This week it's our turn to leave, and we can do so relieved to know that both Zeus and Nui are not just alive, but doing very well, indeed. 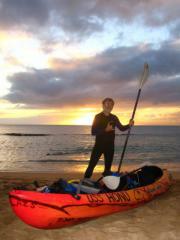 George Balazs visited us and the Honokowai honu this week. This is the second-best highlight of the summer (the best being resighting Zeus). George had heard us talk excitedly about Hoaka and Kahua (two new northern extensions of our dive site). One of the great things about these places is that although they are far from shore, they are shallow enough to snorkel, George wanted to see the site and sights for himself. There was a logistical problem, however. There are only two ways to reach this area. Either you can bust yourself kicking upcurrent and seaward and hope you have enough spit to make it back. 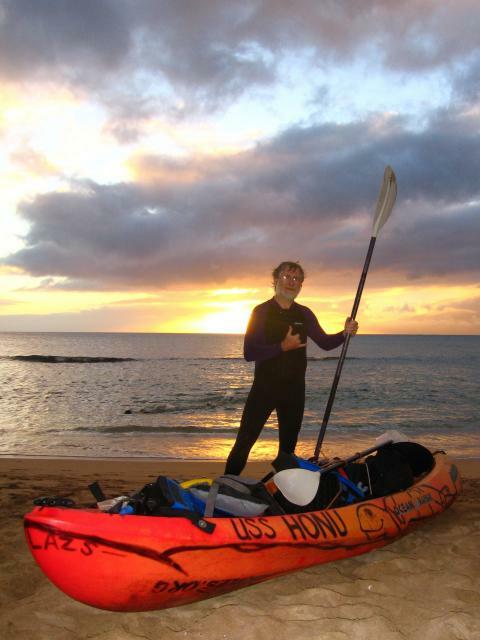 George had only used a kayak once before and never jumped off it to snorkel. He admitted that jumping off the kayak wouldn't be the problem. It would be getting back on. 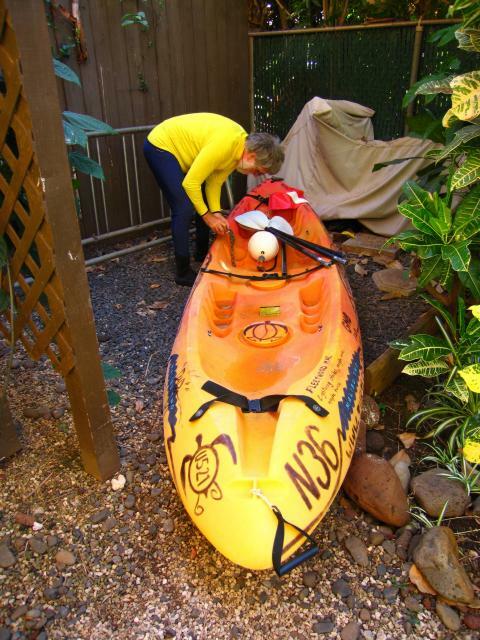 Since that insight is all anyone needs to know about kayaking, we felt that George was now ready to rent one for himself. George managed to get into the kayak without upset. He paddled to get used to the feel of the craft and rocked the thing experimentally to test the kayak's stability. 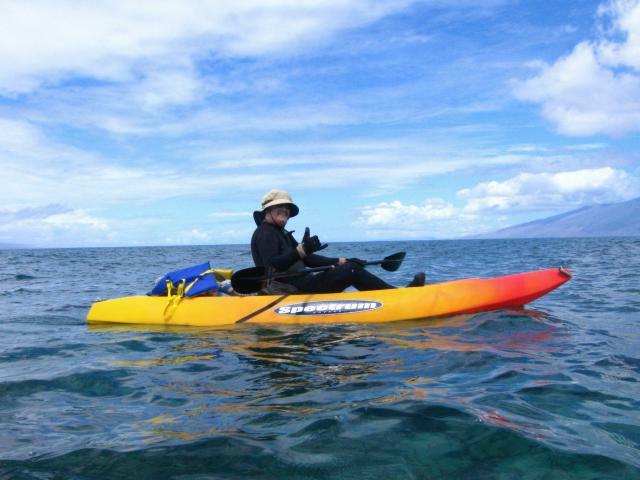 It took all of two minutes for George to love kayaking. The conditions were the best we'd had all summer. The ocean was glass. Visibility couldn't have been better even if we'd been dropping into an exhibit at Maui Ocean Center. 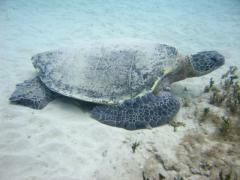 Best of all, there were more honu showing up to give George their aloha than any other time we'd visited there. 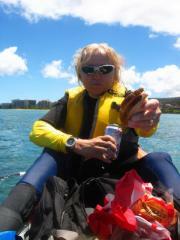 All told, we spent about four hours at the site: snorkelling, then eating lunch on the kayaks, and snorkelling some more. Best of all, we managed to get George home without him capsizing a single time, a much better record than either of us the first time we used a kayak. Kayaks. What can we say? Not so long ago, you'd never have gotten us near one. 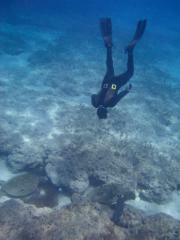 As divers, we considered being on top of the water as an unnatural act! Also, we knew you can fall off a kayak. Above all, boats sink. Now, we love kayaking. 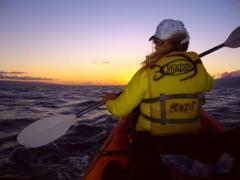 We love our kayak in particular. It is a bought-used MALIBU 2. We can't think of a better craft for us. Everyone we'd talked to said the MALIBU 2 was the best for beginners because it was so stable and "forgiving." We've progressed from aqua-chickens into two people who use their MALIBU 2 like a water pony, jumping off and back on just to have an underwater Look-Round. It's served to carry our SCUBA tank (yes, just the one), our meals, and blessed us with many hours of safe ocean excusions. It has given us a "reach" that would've been impossible--unthinkable--by just snorkelling. Most of all, it provides us a safe haven out from shore when we tire. Or get cold. Finally, we've learned so much more than we would've without this splendid MALIBU 2. 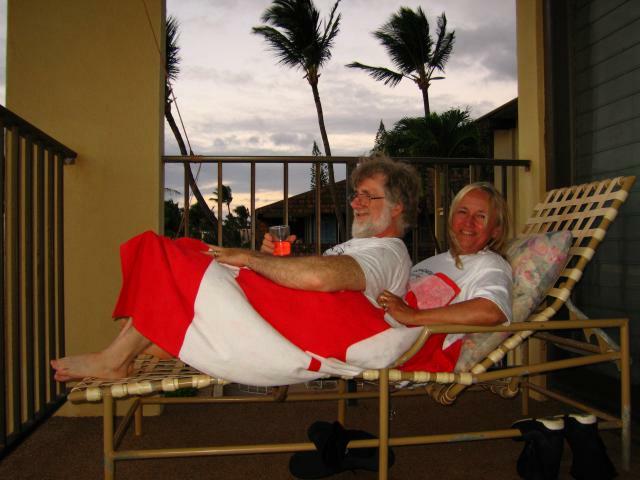 As we write this, we're getting ready to watch one of our last Maui sunsets--this is a "dry" one, observed with the help of bought-in-a-box wine. We have but three Maui days left. Today we completed our last dive. Still, you can bet we'll spend as much time as we can kayaking before it's over for another year. We can't say we're ready to go home because "we" implies more than one person--and Peter isn't ready to go home. Ursula is, however. She figures once the dive gear is put away, that's essentially it: the Fat Lady is about to let loose. Summer's over. Ursula can smell Canadian winter in the air. You start noticing flowers more--and the sparkle off the water. You revel in sunsets more. You even notice grass blades and are happy that you are seeing Maui grass blades. You feel Time Ticking Away. Maui does a real number on you, an addiction that always leaves you wanting more.